The world of art and photography presentation can be a confusing place. We hope that this page will reduce the confusion when browsing and/or placing orders. Square or Circle: Both dimensions are the same. These are some of the cuts available, and the terminology used to describe them. Mats come with at least one rectangular opening. Double mat, light blue outer, dark blue inner. A term used to describe paper materials with a 7 pH, or very close to 7 pH. Acid-free materials are more permanent and less likely to discolor over time. The terms archival or conservation quality more accurately describes true acid-free conservation quality matboard. A double sided tape used to stick mat boards and other materials together. Usually used with an applicator or "ATG gun", available at art supply stores. Wood pulp fibers that have been chemically treated to be acid- and lignin-free. This matboard meets conservation matting standards and provides a lifetime of protection. The framing procedure where all materials are of conservation quality. Conservation framing is the same. The 45-degree cut on a matboard. This allows about 1/16" of the core to be seen. A reverse bevel means the core will not be seen from the front of the mat. This is a mat especially designed to have a very black core. Usually it is not of conservation or archival quality. It is a bit more expensive than regular matboard. A term used when additional border is applied to the bottom of a mat but not the top. In some instances it can look very good. A negative is that the mat cannot be used both vertically and horizontally. The framing procedure where all materials that come in contact with the artwork are completely acid-free. This minimizes the effect of adverse atmospheric conditions, and generally provides a lifetime of protection for artwork. A general term used to describe archival or museum grade matboard. The two types of materials used to make conservation matboard are cotton (AKA rag mats) and wood pulp fibers (AKA alpha-cellulose mats). A double mat is two mats put together, but with a slightly larger opening on the top mat. This difference (the amount of the bottom matboard showing under the top mat) is called the "reveal". When ordering, define only the exact opening you require and the reveal. A common reveal is 3/16" which shows a solid color of about 1/8" once the bevel edge is cut. A double mat (or more) is used. The bottom mat does not have an opening. The opening in the main mat is larger than the image. The image is attached to the bottom mat, so a small portion of this mat can still be seen. A stiff light material used as a backing board to give rigidity. Foam makes up the core of the board with a layer of paper on its surfaces. Foamcore is usually 1/8" to 3/16" thick, and is very smooth. Excellent for mounting images such as posters and lighter paper. Metal tools used to assemble and hang a frame. All necessary hardware is shipped with MatShop frames. This is the size of the actual image, not the surrounding border. Unless part of the border is to be shown, the window of the mat should be smaller than the image size in order for it to be attached to the back of the mat. A natural chemical compound that can cause paper degradation. A piece of decorative or conservation material (see matboard) used around artwork and often under glazing and a frame. Mat is the standard spelling used by MatShop. Also commonly spelled matte or, less often, matt. 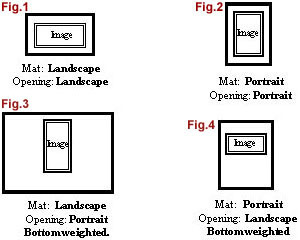 In the picture framing industry, a mat (or mount in British English) is a thin, flat piece of paper-based material included within a picture frame, which serves as additional decoration and to perform several other, more practical functions, such as separating the art from the glass. A board is comprised of two or more parts, commonly; the core, the backing paper and the paper face or surface paper. Most matboard is 4ply or about 1/16 inch thick. Occasionally 2 ply, Ultra Thick (7ply), or 8ply mats are used. Matboard is available in many forms. Other common spellings are: matteboard, mat board, matt board, or matte board. The center material of a matboard. Usually 1/16 inch thick. It can be regular or conservation quality. Colors vary from cream or off-white to white and black core. A board used to mount images when this is necessary. Regular or acid-free foamcore make excellent mounting boards. An acrylic material used instead of glass. It is very light in comparison to glass and much more resistant to breakage. We use both 1 mm. plexi (.040") and 3 mm.plexi (1/8"). The term used to describe how a frame moulding looks when viewed from one end. It will describe the width and height of the mat, and the dimensions of the rabbet. The rabbet describes the 90 degree cut made to house the glass and mat package. Also known as cotton matboard. It is comprised of cotton fibers and is naturally acid- and lignin-free. Rag mats provide the highest standard of conservation matting. Regular matboard is buffered to be pH neutral (acid-free) and will provide 10-15 years of protection. It is often termed simply as "acid-free" but should not be confused with conservation quality matboard due to a shorter lifespan. In a double mat, the reveal is the amount of the bottom mat that will show. The rest will be behind the top mat. Frames with various rabbet depths. These may be ½ inch up to 4 inches or larger. These frames are generally very expensive. Boxes made of differing materials which fit into any standard wood frame. They can be lined with any matboard to be make a very professional presentation. These are much less expensive, and used extensively in the memorabilia framing industry. Can be used between the mat and backing to create a space when a "shadow box" effect is required. A piece of foamcore will give 3/16 inch space for the shadow box effect. There are two standard types of v-grooves: open and closed. A closed v-groove is a thinly carved v-shaped line deep enough to show a mat's core color, but not enough to cut through the mat. An open v-groove requires a second mat, as it is spaced enough to show the mat underneath. The opening in a mat board through which the image will show. The window is usually 1/8 to 1/2 inch smaller than the image so the image can be taped to the back of the mat. For example a 5 x 7 photo (exactly) should have a window of approximately 4 1/2 x 6 1/2 inches. This is a mat especially designed to have a very white core. Usually it is not of conservation or archival quality. It is a bit more expensive than regular matboard.